Urbana’s Maleah Murphy (11) gets plunked during the second inning of Thursday’s contest with Triad. For the Cardinals, Holly Alvoid was 3-for-3. Gracie Sheets was 2-for-4, Kirstin Bailey was 2-for-4 and Joni Russell doubled. For Urbana, Makenna Radford was 2-for-3 with an RBI, Emily Skelley was 2-for-4, Marah Donohoe was 3-for-4 with an RBI and Cady Perry was 1-for-3 with a double, an RBI and a run scored. Today, Triad (3-1) hosts Northeastern while Urbana (0-6) hosts London. 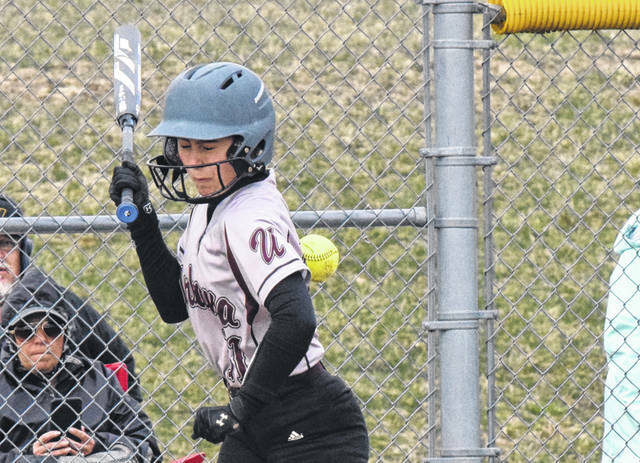 LEWISTOWN — Indian Lake defeated Graham, 13-3, in CBC/MRD softball on Wednesday. For the Falcons, Sara Masters was 1-for-2, Alyssa Theodor was 1-for-2 with a triple, Lexi King was 2-for-3 with 2 RBI and Morgan Pine was 1-for-2. Pine took the loss in the circle. Graham (4-2, 1-2) hosts Kenton Ridge today. DAYTON – West Liberty-Salem downed Northwestern, 12-1, in six innings of non-league softball played at Wright State on Thursday. For the Tigers (4-3), Kelsey Day earned the win and was 2-for-2 with a home run and 2 RBI. Kayle Henderson also had 2 RBI and Maddie Estes was 2-for-4 with a home run. LONDON – Urbana downed London, 4-1, in boys tennis on Thursday. At 2nd singles, Ethan Headlee won, 6-0, 6-0. At 3rd singles, Jacob Coffey won, 6-2, 6-0. At 1st doubles, Michael Trudo and Riley Johnson lost, 3-6, 6-3, 6-2. And at 2nd doubles, Zach Hoskins and Kyle Rooney won, 5-7, 6-2, 6-1.
https://www.urbanacitizen.com/wp-content/uploads/sites/36/2019/04/web1_Ouch040419.jpgUrbana’s Maleah Murphy (11) gets plunked during the second inning of Thursday’s contest with Triad.